Wishing all of you a very happy and prosperous new Year 2009!! The year 2008 will be a special one-I started my blog and am still at it..something definitely worth cheering about.I made so many new friends in the virtual world and am encouraged by so many to do new things and appreciated by many for my efforts.I don’t think I could have come this far without all this,I sound repetitive,but that’s exactly what I feel and have to say-without you guys,I surely couldn’t have come this far.Thank you folks!! I started the new year with a healthy banana cake/bread.Which reminds me,when I was small,every thing was done carefully on the new years day,every step was watched carefully because I hopelessly believed that whatever was done in the new years would continue throughout the year..;-).So I played safe and made a healthy cake,hoping that this whole year,I’ll make healthy stuff..silly me;-). 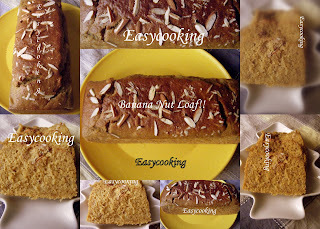 I followed Raaga’s recipe blindly and as usual the result was fabulous.Next time,I am gonna make an eggless version.Thank you Raaga for this wonderful loaf!! Heat the oven to 175*C. Grease and dust a loaf tin. In a big mixing bowl combine bananas,eggs,oil and jaggery. Add the dry ingredients and make a smooth batter. Mix well and pour the batter into the prepared loaf/cake tin. Sprinkle some slivered almonds on top. You can omit the egg and use 2-3 tsp sour curds and 1/2 tsp baking soda. Bake for 35-40 minutes (or until a skewer inserted into the cake comes out clean). yummy looking loaf. would like to try the eggless version. if u do try, let me know. Wonderful Divu, well I think me n my few frnz r also in the same category-first day of the year we shd do what we wish the year to repeat...:D Thats a lovely looking Loaf! Raaga sure is one machi hui cook! Wish you a happy & healthy new year! !